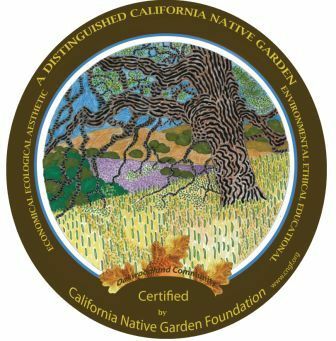 In 2009, CNGF launched the Distinguished Native Garden Certification program. We’re optimistic that we can influence more people to lose their lawns and go native! Our certification program is similar to the Wildlife Federation’s Certification Program. See if your garden (or planned garden) measures up by reviewing the criteria for native garden certification. You should have a plan for or have implemented the following criteria. Eliminate or greatly reduce the lawn. Eliminate invasive plants, such as ivy, from your garden. Retain rainwater on the property. Cover all landscaped areas with at least 3 inches of mulch, except for a patch of dirt to encourage native bee nesting. Create a habitat for wildlife with one or more of these: meadow of wildflowers and berries, detritus, native trees and shrubs. Provide a source of water for wildlife, such as a fountain, pond, birdbath, or rain garden. Provide drip irrigation or another water-wise method. If your garden qualifies, you can purchase a certificate of merit suitable for framing or an original sign or banner (your choice) to display in your garden. Alrie Middlebrook has created two original drawings of California’s landscapes for the sign art: an oak woodland and a wildflower grassland. The signs and banners are delivered with a hand-crafted wrought-iron stand, custom-made and hand-forged by a local artisan blacksmith. See the available banners, bio-board signs, and certificates. CNGF’s program will help you spread the word to your friends and neighbors. We hope you’ll want to display your garden art sign or banner in your Distinguished California Native Garden. The materials for the banners and signs are recycled and recyclable. We got as green as we could for this certification.